A lot more investors have been emailing me lately, fearful of a market downturn. This tells me one thing: today’s market is a scared market. But you don’t need to be scared. In fact, thanks to overhyped investor fears, you can easily lock in 7% dividends and prepare yourself for a downturn with less risk than you’d get buying stocks directly. The key? The 5 unloved (for now) funds I’ll show you in a moment. First, though, you might be wondering why I say these funds are less risky than individual stocks. For one, each of these 5 hold hundreds of assets, spreading your cash out in a way that a basket of a few stocks can’t. Second, and more important, these funds invest in more than just US stocks, exposing you to different asset classes, as well. Why is this important? Because not all asset classes behave the same way in a crash. Note that high-yield bonds (here in red) also suffered during the period, but not as badly; in fact, high-yield bonds (which are the most closely correlated with the stock market) never dipped as low as stocks and recovered more quickly. Meanwhile, municipal bonds (orange) hardly fell at all, even in the worst part of the downturn, and US Treasuries (green) actually went up. If this doesn’t convince you that you need to diversify beyond stocks, nothing will. On that note, here are my 5 fund picks to get you a well-rounded portfolio and those 7% dividends I mentioned earlier. 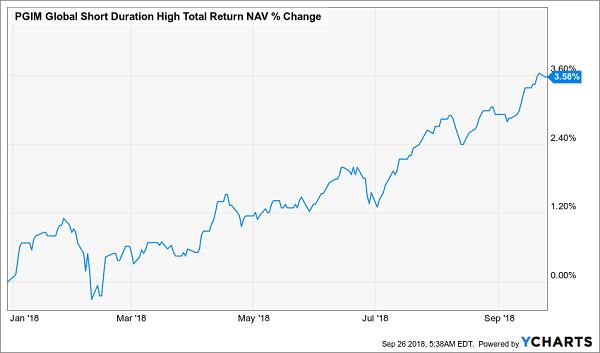 The Dividend and Income Fund (DNI) is a closed end fund (CEF) holding a collection of US stocks with a singular focus: handing you a high dividend. And with a 6.6% yield, DNI delivers. The way this fund gets that income is solid, as well. With 92 stocks in the portfolio, DNI gives you tremendous diversification while focusing on well-known large cap names like Apple (AAPL) and the Walt Disney Company (DIS). But the best part is the discount. When the market realizes this mistake, expect DNI to rise significantly. Until then, enjoy those fat dividend checks. To say the PGIM Global Short Duration High Yield Fund (GHY)—with over 370 bonds in its portfolio—is diversified is an understatement! And with its 7.2% yield, GHY is an overachiever on the income and diversification fronts. The fund’s mandate is simple: buy the highest quality bonds from around the world, focusing on corporate bonds issued by the most financially sound companies. Hence the fund has bonds from NCR Corporation, Beazer Homes, Bombardier and Nielsen plc. 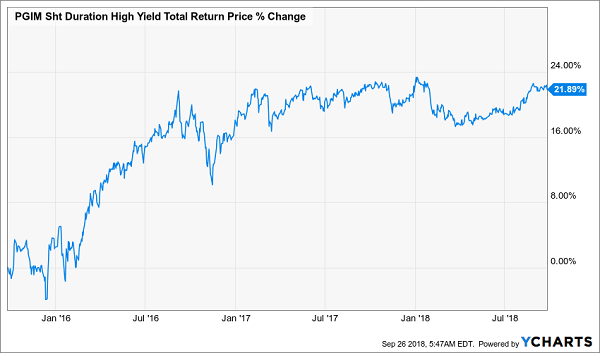 To make this portfolio even safer, GHY focuses on short-duration bonds, or those that will expire within the next couple years, lowering your exposure to rising rates (which cause bond prices to go down) and the possibility of any default from the companies issuing these bonds. The result? A 14.6% discount on a fund of high-quality bonds that are the least risky in this interest-rate rising environment. What a perfect buy now, just when the market is getting jittery. 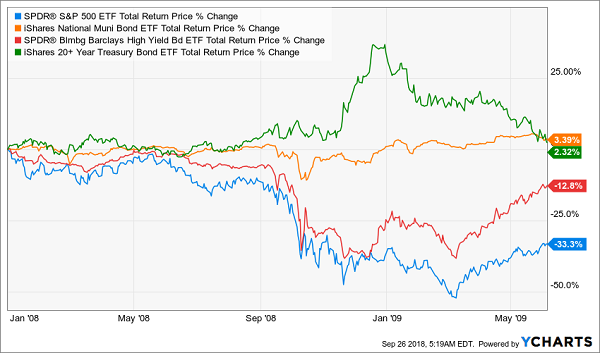 The Western Asset Intermediate Municipal Bond Fund (SBI) has a great track record of consistently high returns, with a 5.7% total return per year over the last decade. Similarly, it’s chock full of high-quality issues from growing cities like Miami, as well as municipalities with increasingly healthy tax revenues, like California. But the market hates it. At a 14.3% discount to NAV, SBI is one of the cheapest municipal-bond funds out there, despite the fact that its dividend yield, 4.6%, is one of the highest in the muni-bond sector. And remember that those dividends are tax-free for many Americans, which means the tax-equivalent yield is closer to 6% for a lot of high-income earners. 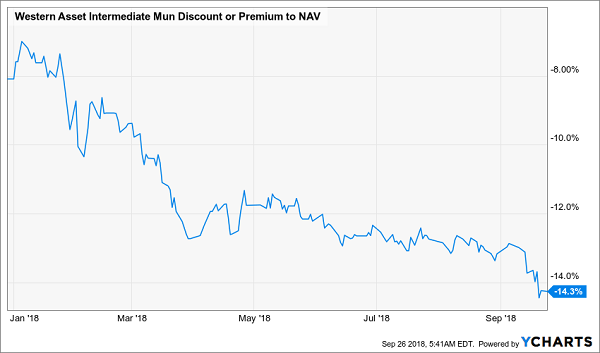 Since municipal bonds are one of the least volatile asset classes, and since munis proved their resilience in 2008–09, despite Chicken Littles’ warnings to the contrary, this is a great option for steady income and a smooth ride into an uncertain future—exactly what you need when the market is getting scared. Similar to GHY, the Prudential Short Duration High Yield Fund (ISD) focuses on short-term bonds to lower risks while delivering the highest income stream it can. And that’s why ISD shareholders are getting a steady 7.2% yield from this underappreciated fund. And when I say “underappreciated,” I mean it: at just $543 million in assets under management, ISD is a blip in a world of multi-billion-dollar ETFs. 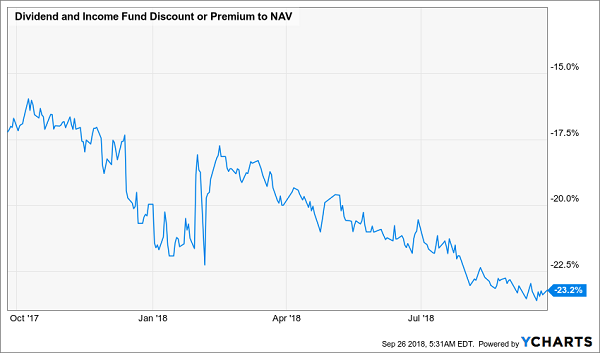 That’s why this fund is priced so inefficiently: its discount to NAV is a massive 13.6%. Since the Fed still plans to raise rates significantly in the next couple of years, demand for ISD isn’t going anywhere—which is why it’s a great buy right now. Value investing gets a bad rap these days, because the market has gone up so high so fast. When that happens, everyone looks like a genius, which makes people question why Warren Buffett is worth paying attention to. 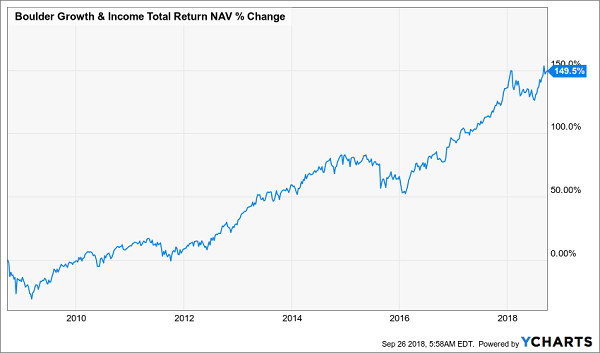 The genius of value investors like Buffett only becomes obvious in major downturns, when their shrewd approach results in less volatility and smaller losses than the market. 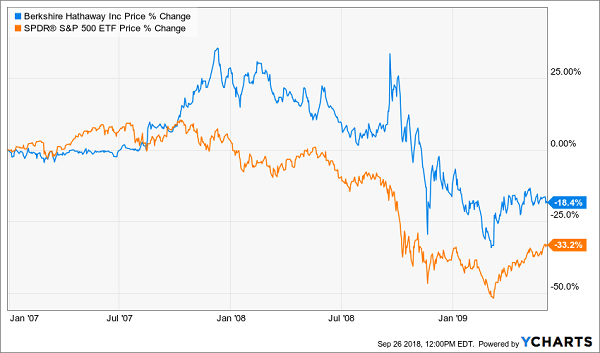 Note that Berkshire Hathaway stock never fell as low as the market and actually stayed positive longer than the market (not seen in this chart: Berkshire fully recovered in October 2011, three months before the market did). And there’s a fund that focuses on Buffett’s value-investing style while also paying an income stream: the Boulder Growth & Income Fund (BIF). With a third of the fund in Berkshire and most of the rest in companies Buffett owns, like JP Morgan Chase & Co. (JPM), BIF mimics the value-investing king. 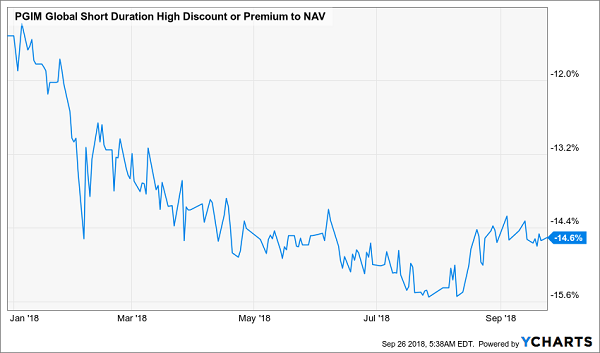 And you get Buffett ownership at a discount: a 15.6% discount, to be exact, since BIF is selling for that much less than its portfolio value. BIF’s income stream isn’t great compared to the other funds outlined here, at just 3.4%. But it’s a lot better than the 0% Berkshire pays out, and BIF’s payouts are growing like a weed, up over 250% from a decade ago. And the fund has been soaring for a long time. 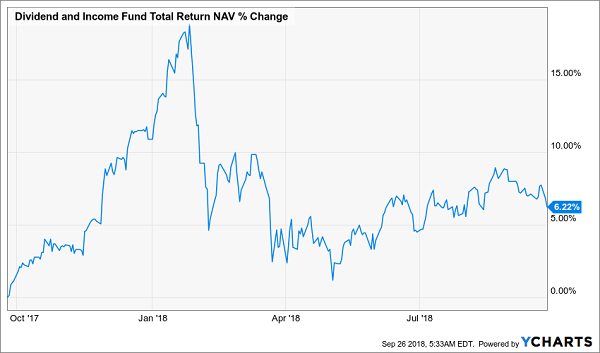 With rising payouts, strong NAV growth, and diversified, principled investing, BIF is a rare stock fund you can feel confident in, even if a market crash is around the corner.